Along with the new, smaller 4-inch iPhone SE, Apple announced a new smaller iPad Pro version, the 9.7-inch iPad Pro. The 9.7-inch comes in a little more than three inches than the original iPad Pro 12.9 (see the two products side by side above), but is still likely more tablet than most of us will ever need. While this new smaller iPad Pro has all the attributes of its larger 12.9-inch sibling, it offers far improved cameras, front and rear, compared to both the larger Pro and the Air 2: 12MP on the back (vs. 8MP on the 12.9-incher and the iPad Air 2), a larger f2.2 aperture (vs. f2.4) with faster auto focus Focus Pixels and True Tone flash, 3-second animated Live photos, 4K video recording (vs. 1080p) and 5MP FaceTime photos (vs. 1.2MP) with Retina flash for more brightly-lit selfies. "Hey Siri" that, when spoken, unlocks your phone and can open your email, go to a Web site or answer a question. 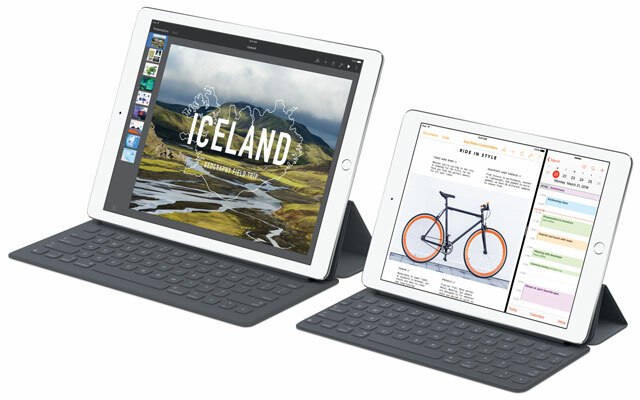 There'll also be a variety of optimized smart keyboard case options and the Apple Pencil, which lets you draw freehand on the Pro's screen just as you would on a piece of paper – the screen knows the difference between your hand resting on the screen as you draw and the actual Pencil point or finger control touches. And, the 9.7-inch iPad Pro maintains the same 6.1mm thinness of the Air 2 and the same .96 pounds weight, making it easier to tote than the 1.59-pound larger version. This new smaller laptop replacement/Microsoft Surface competitor will go on pre-sale this Thursday (March 24) with delivery a week later at $599 for 32GB, $749 for 128GB, and $899 for the new 256GB capacity ($1,029 for the LTE version) in silver, gold, space grey, rose gold varieties. Apple also will drop the price on its current iPad Air 2 models by $100 – the new 16GB starting price will be $399, and the Air 2's 128GB version will be discontinued. I was about to buy the 12.9 iPad pro but after reading your post I would definitely consider the 9.7 inch version. Good camera is all you need on the go, specially when you are an avid traveler like me.